U.S. Ambassador to Uzbekistan , George Krol in the Uzbek media interview, said Washington is consulting with Uzbekistan to settle the Iranian nuclear problem, the correspondent of IA REGNUM . “We need to engage in dialogue with our colleagues from Uzbekistan, explaining to them the position of the U.S. to resolve this difficult situation between our two countries, and to show what role can play Uzbekistan in Iran. Uzbekistan has a geographical and geopolitical weight in the region and influence. Given this, we want our Uzbek colleagues – diplomats, experts, competent people in these matters – also talked about it and advised us how to solve this global problem. I want to emphasize that the State Department special value are the opinions of local experts “- said Krol. According to him, the U.S. plans to solve the Iranian problem through consultations through diplomatic channels. “It was always for the Iranians and the door to negotiations is always open. Our diplomats are working around the clock on this issue. Our main aim – to prevent armed conflict. Who needs this war? It’s a disaster. We all understand that. The Iranian issue should be handled and the international the community. Therefore, we do not only consult with Uzbekistan, but also working with Russia, NATO , etc. I think that if the Iranian political leadership understands the stalemate, it should not prevent the creation of nuclear weapons. Who needs it? United States does not object If Iran is to introduce research into the use of nuclear energy for peaceful purposes. If they want to seriously address the problem not only U.S. but also neighbors, we are ready for such talks, “- concluded the diplomat. The Israeli delegation headed by Director General for Relations with International Organizations Foreign Minister Pinhas Avivi held in the Turkmen capital Ashgabat, a series of talks, according to local media on Wednesday. The Israelis were taken on Tuesday in the Turkmen Majlis (Parliament), Ministry of Foreign Affairs, Ministry of Trade and Foreign Economic Relations, Ministry of Agriculture, State Concern “Turkmengaz”, as well as the Institute of International Relations of Turkmenistan.The sides called for enhancing multi-faceted partnership in the long term, for the establishment of close inter-parliamentary relations and the foreign ministries of both countries, local media said. Turkmenistan remains faithful to one of his top foreign policy priorities – the development of cooperation with neighboring states. Despite international sanctions against the Islamic Republic of Iran, Turkmen-Iranian cooperation is on the rise. Iran is one of the largest trade partners. Annual deliveries of Turkmen gas to Iran, carried out on two pipelines are about 16 billion cubic meters. Over time, the parties intend to increase their supplies to 20 billion cubic meters. In addition, Turkmenistan and Iran are involved in the creation of international transport corridor North-South (the railroad Kazakhstan – Turkmenistan – Iran).According to experts, after this road will be constructed and connected with the railway system of Russia, will open the best railway transportation route between Europe and the Persian Gulf. 30 and 31 January in Bishkek at the U.S. Embassy held a protest, demanding to withdraw from the territory of KyrgyzstanU.S. servicemen stationed on the basis of “Manas”, renamed two years ago, the Transit Center (TSC). A February 1 protesters handed over their claims to the department for receipt of applications of the Parliament of the Republic. Meetings, which were attended by 15-25 people, NGOs had “Asir” and People’s Union “New forces in Kyrgyzstan.” They expressed frustration that NATO planes, dropping fuel, causing damage to the environment of the country. On the first day of the rally, participants hung on sticks boots and unfurled banners demanding an end to the activities of CTP and offset the environmental damage caused. “There are no politicians who are gathered here just peasants. 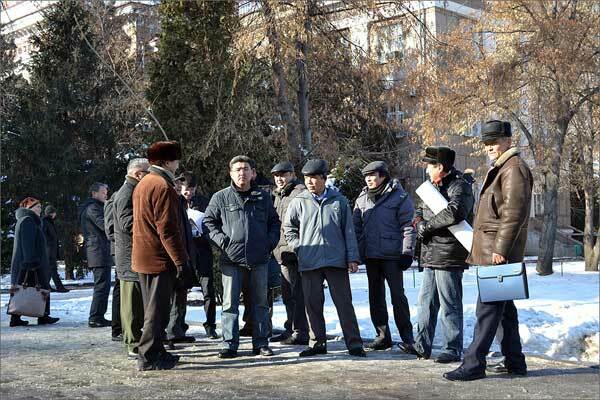 We raised the boots, because the Kirghiz have a tradition – raise your shoes before the ruling that they understand the problems of the peasants “- quoted protesters AKIpress . “Killed 30 hectares of land, who is dying cattle. In the villages Beshterek, Sabyr, Steppe and others nearby to “Manas”, the same situation. As soon as the warmer, get out, put a tent and will demand the closure of the airbase, “- said the resident of the village of Kara-Suu Tolombek Tursunaliev. In addition, the protesters fear that the transit center could strike Iran in the event of war with the United States. Protesters chanted: “The devil, go away,” “Yankee, go away!”, Reports Regnum . “Today, in Bishkek airport” Manas “is the Transit Center, and in fact a military base, which provides for military operations in Afghanistan. Because of greed and political cowardice of the authorities of Kyrgyzstan has for 10 years as a result of discharges of fuel, which carry the American planes, causing irreparable damage to the environment of the country. The people of Kyrgyzstan became an accomplice to criminal offenses, the so-called forces of the international coalition against terrorism that spread violence against the civilian Afghan population. In addition, in recent months, sharply worsened relations between the U.S. and Iran. Most experts believe that the war between the U.S. and Iran will be. In this case, Tehran threatens to strike missile strikes against bases of the United States, including the transit center at the airport “Manas”. SINCE the NATO alliance announced in 2010 it would withdraw US-led forces from Afghanistan by the end of 2014, we have been waiting for the details. Yesterday, Defence Secretary Leon Panetta said the US would “step back from a combat role” as early as the middle of next year. The US has 90,000 troops in Afghanistan following the withdrawal of 10,000 last year, and another 23,000 will be gone by September. Panetta did not give a timeline for the final withdrawal of Western forces, but said it would be “orderly”. Leaving Afghanistan in 2014 was a fair date, given certain assumptions. Among these was the size of the US surge (40,000 troops requested) and its impact on the south of the country, the expectation some of the surge troops could be used to stabilise the south and then move on to the eastern provinces, the success of the drone war in Pakistan, and the relatively stable relationship with Islamabad (at least compared with today). As well, it was reasonable to think the Taliban might reckon they had to negotiate fairly or be beaten on the battleground. To the US military leadership in Afghanistan in 2009 to 2011, a 2014 withdrawal date was doable. Almost none of those assumptions survive today. The impact of the surge was limited by the White House’s nine months of procrastination on the decision during 2009. Only 33,000 of the 40,000 troops requested were provided. The overall effect was limited because the US President announced the withdrawal of the surge troops at the time he announced the commitment. The time to consolidate gains in the south and southeast is not available because of the speed of the White House’s withdrawal timetable against the advice of the generals and military officials. The impact on the eastern provinces will be limited because of the withdrawal of another 23,000 troops this year and the possible “rush to the exits” of coalition allies. The drone war was stopped and only restarted in a limited way recently, and the Taliban have taken full advantage of the pause. Finally, the US relationship with Pakistan is truly appalling after the attack on a Pakistani border post. But a withdrawal has to occur at some time, and the first step is to limit foreign participation in the fighting while still mentoring the Afghan troops and police. But this only has logic as a strategy if there is a capacity to intervene if the Afghan security forces fail. Otherwise it is just the first step to a withdrawal that will go ahead regardless of what happens in Afghanistan. Most commentators are likely to welcome the withdrawal because it is pretty well impossible to criticise it in advance, and it will be too late to criticise later. However, I contend there is nothing inherently good about ending a war if it is ended unsuccessfully. And success is all about Afghanistan having a fair chance of existing otherwise than under Taliban oppression. There is also nothing inherently good about “peace talks” if they are a device for merely running away. I have maintained for years that the Afghanistan war was not the Vietnam War, but this current phase has far too many similarities with the period from 1968 to 1973 in Paris and Vietnam. The manner of the West leaving this war will be as important as our 10 years of involvement in Afghanistan. The US Secretary of Defence’s announcement yesterday seemed to be much more about calendars than about conditions. Jim Molan was chief of operations of the multinational force in Iraq in 2004-05. Washington: When the road and the destination are both foggy, getting lost becomes a real possibility. The US administration’s attempt to engage the Taliban is a risky endeavour set in the sands of shifting red lines. The motive driving the project is a search for a graceful exit or something resembling it before the 2014 deadline announced by President Barack Obama. It seems at any cost. US officials admit they are very far from serious negotiations but this time they are sure they have a reliable conduit to the Taliban. Everything else is unclear and unknown. Here are the many “known unknowns”, to use Donald Rumsfeld’sunforgettable phrase: whether the conduit can really reach the Quetta shura of top Taliban leaders in Pakistan; whether the Quetta shura is interested in serious talks; what it wants; whether it will in turn talk to the Afghan government; whether Pakistan will play a spoiler or guarantor of peace; and whether US engagement with the Taliban will streng-then the hand of PresidentHamid Karzai or weaken it. The flurry of recent activity shows Washington’s eagerness to put a plan in place before Obama becomes vulnerable to charges from Republican presidential candidates that he “lost” Afghanistan. The basis for enthusiasm are two statements issued by the Taliban in the New Year, seen as concessions big enough by the US to contemplate the release of five hardened terrorists. The first announcement said Taliban would open an office in Qatar and talk to the world. The second said talking did not mean an end to jihad or acceptance of the Afghan constitution. The Taliban red lines are clear but what about the US red lines? Over the long years of this war Obama once called “necessary”, US preconditions for negotiations have been that the Taliban should disarm, work under the Afghan constitution and sever all ties with al-Qaida. But these have now morphed into “necessary outcomes” to meet the 2014 deadline. The shift is significant. The Obama administration appears willing to hand over five Taliban commanders currently inGuantanamo Bay as a “confidence-building measure” without significant concessions in return. It has made no demand on the Taliban – at least publicly – to end suicide bombings, which have become a method of systematically eliminating representatives of the Afghan government, especially those effective in getting insurgent groups to work with Kabul. The governor of Panjwai district in Kandahar was killed in a suicide attack on January 12, the day the Taliban released the second statement. Sayed Fazuldin Agha was credited with bringing relative peace to his region and persuading several Taliban groups to join his effort. In the two years before 2014, the Taliban will kill many more as they play for time. This is not just an attempt to show a strong negotiating hand but a way of life. Remember Mullah Omar’s words that his fighters are “ready to sacrifice everythinga¦until there is no bloodshed in Afghanistan and Islam becomes a way of life for our people”. To reach the “no bloodshed” stage, an untold amount has already been shed and will continue to be shed. From the Taliban’s previous run, the kind of Islam they practise is also no secret. It is neither inclusive nor gentle. But supporters of the “quick exit” strategy say bluntly that the “Taliban’s religious fundamentalism is not the war the US has chosen to fight”. The core US goal is to defeat al-Qaida, destroy its safe havens in Pakistan and prevent its return. Taliban’s ideology is not at issue and should not be the basis for negotiations. Human rights can be dealt with later, they add casually. This is dangerous talk. Even desperate. To exit at any cost risks a replay of the five-year Taliban rule (September 1996-October 2001) when women were shut in and girls denied basic education in addition to many other horrors. There is no indication that Mullah Omar’s men have improved their vision. Their blueprint for the future will be set in the past. They must not be given ascendance over Karzai’s government or allowed to squash the rights of other ethnic groups. It might even be time to question the belief that the Taliban give voice to Pashtun alienation, a story forcefully embedded in the western mind by Pakistan’s former military dictator Pervez Musharraf to feed the idea of strategic depth. After years of war, one may even question if the Taliban have grassroots support except what they gather by force or fear. Going beyond the Pakistani media’s infatuation with the idea, many Afghans don’t share good feelings about the Taliban. To her credit, secretary of state Hillary Clinton was bru-tally honest when she admitted recently that Washington didn’t have “any idea” where the engagement policy may lead, if anywhere. A real beginning is far into the future but exploring the idea of talks is necessary because of America’s loss of appetite for war. Even if the Qatar office delivers progress, an actual deal must still be struck bet-ween the Taliban and Karzai of which continued US presence in Afghanistan beyond 2014 will be an important part of the puzzle. What Pakistan will do is a dark mystery. The decision to send foreign minister Hina Rabbani Khar to Kabul could be an attempt to open a separate channel to Karzai by Pakistan’s army-ISI to upstage the US. Or it could be an attempt to play a constructive role. One can only hope it’s the latter, and hope is a large part of the US policy mix. Australian special forces could remain fighting in Afghanistan for years after an official international troop withdrawal, Defence Minister Stephen Smith says. Speaking to reporters in Perth, Mr Smith said Australian special forces would likely remain behind in Afghanistan after the official withdrawal of about 1500 troops, which was on schedule for 2014 or earlier. “Any transition has to be conditions-based,” Mr Smith said on Wednesday, before leaving for Brussels for an international defence ministers’ meeting on Afghanistan this week. “Once the transition occurs – whether that’s in 2014 or earlier – there will be a continuing need for some form of assistance. “Our objective in Afghanistan is to make sure that Afghanistan does not again become a breeding ground for international terrorists. Mr Smith said while he did not want Australia to remain in Afghanistan for years to come, he admitted there was no time frame on when special forces would all leave. “Because our special forces are so highly regarded, one of the possibilities that I’ve spoken about publicly is an ongoing presence,” he said. Mr Smith’s admission came as he announced the deployment of trained interrogators from Australia to Afghanistan to help question those detained during Australian military operations. The development coincides with the government’s decision to extend the amount of time detainees can be held for interrogation at Australia’s Tarin Kowt Initial Screening Area in Afghanistan from four days to 10 days. “The development of this capability will enable the Australian Defence Force to play a greater role in the collection of vital information, and will support the protection of Australian and International Security Assistance Force (ISAF) personnel and the local population,” Mr Smith said. Mr Smith said the Brussels meeting between NATO and ISAF defence ministers would discuss an ongoing progress in Afghanistan ahead of a Chicago summit in May that will deal with the post-transition arrangements. Russia and NATO are planning to hold joint computer-simulated missile defense exercises in Germany in March, Russian Deputy Defense Minister Anatoly Antonov said on Thursday. The decision to conduct these drills was taken atthe NATO-Russia Summit in Lisbon in November 2010. Antonov downplayed the importance of the upcoming exercises in light of the current deadlock in missile defense talks between Russia and NATO. Russia has proposed a joint system, while NATO favors two independent systems which exchange information. Moscow is seeking written, legally binding guarantees that the U.S.-backed European missile defense network will not be directed against it. Washington, however, refuses to provide the guarantees, saying the shield is directed against threats from Iran and North Korea.